The historic centre and docklands of the maritime mercantile City of Liverpool bear witness to the development of one of the world’s major trading centres. 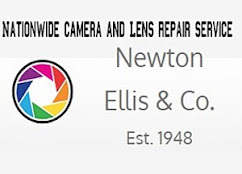 In the 18th and 19th centuries. 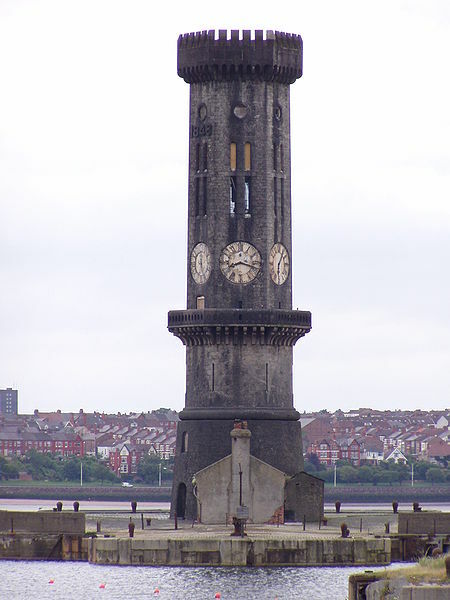 Liverpool played an important role in the growth of the British Empire and became the major port for the mass movement of people, from northern Europe to America. Liverpool was a pioneer in the development of modern dock technology, transport systems and port management. The Port of Liverpool is the enclosed 7.5 miles (12.1 km) dock system that runs from Brunswick Dock in Liverpool to Seaforth Dock, Seaforth, on the east side of the River Mersey and the Birkenhead Docks between Birkenhead and Wallasey on the west side of the river. 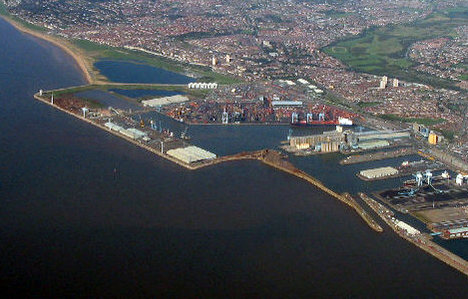 Garston Docks, which are in the city of Liverpool, are not a part of the Port of Liverpool. 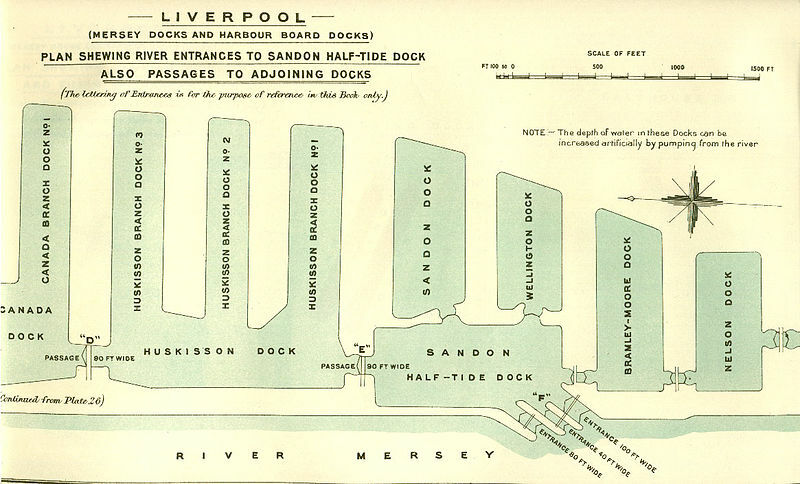 The working docks are operated by Mersey Docks and Harbour Company, the docks to the south of the Pier Head in Liverpool are operated by British Waterways. 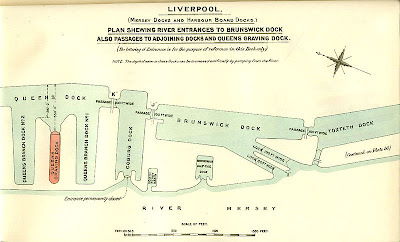 Liverpool's first dock was the Old Dock built in 1715. The old Pool was converted into the enclosed dock. The dock was the world's first enclosed commercial dock. 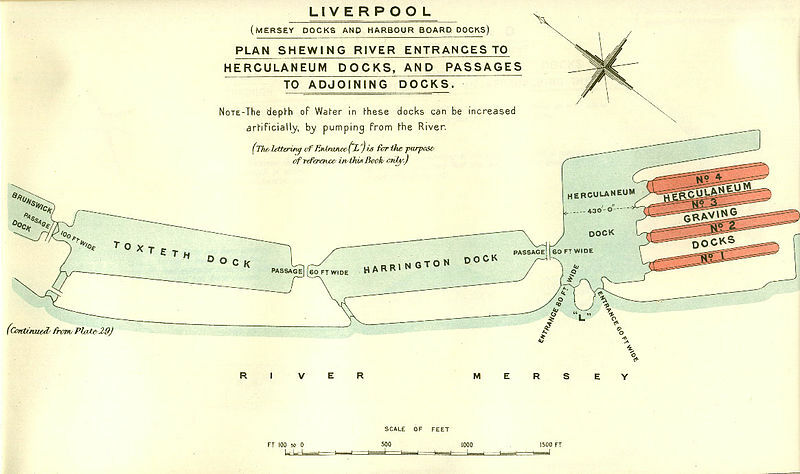 Further docks were added and eventually all were interconnected by lock gates, extending 7.5 miles (12.1 km) along the Liverpool bank of the River Mersey. 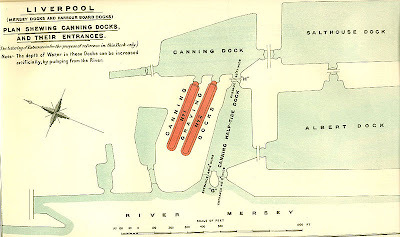 The interconnected dock system was the most advanced port system in the world. 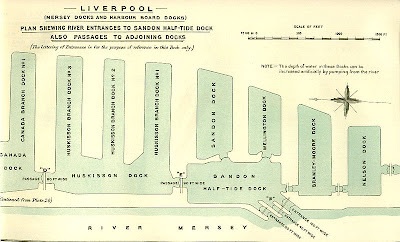 The docks enabled ship movements within the dock system 24 hours a day, isolated from the high River Mersey tides. 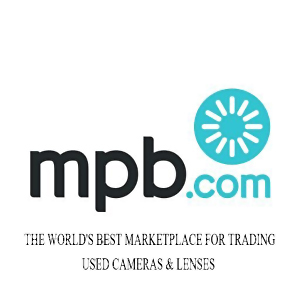 Parts of the system are now a World Heritage Site. Most of the smaller south end docks were closed in 1971 with Brunswick Dock remaining until closure in 1975. 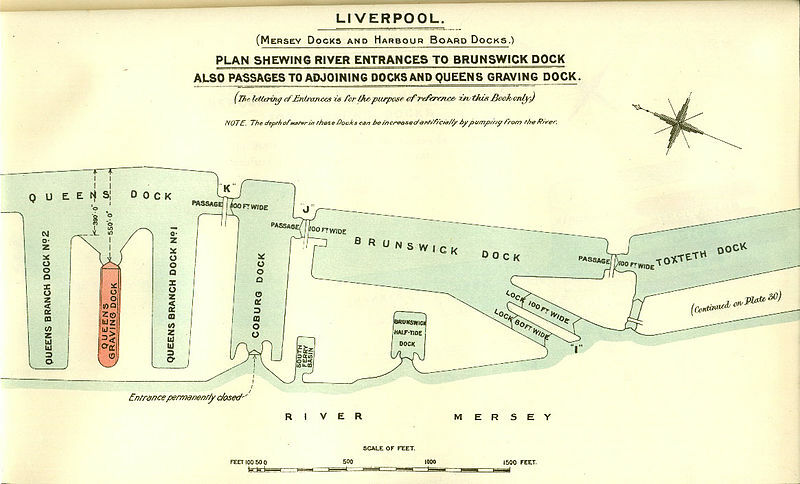 Many docks have been filled in to create land for buildings at the Pier Head, an arena at Kings Dock, commercial estates at Toxteth and Harrington Docks and housing at Herculaneum Dock. 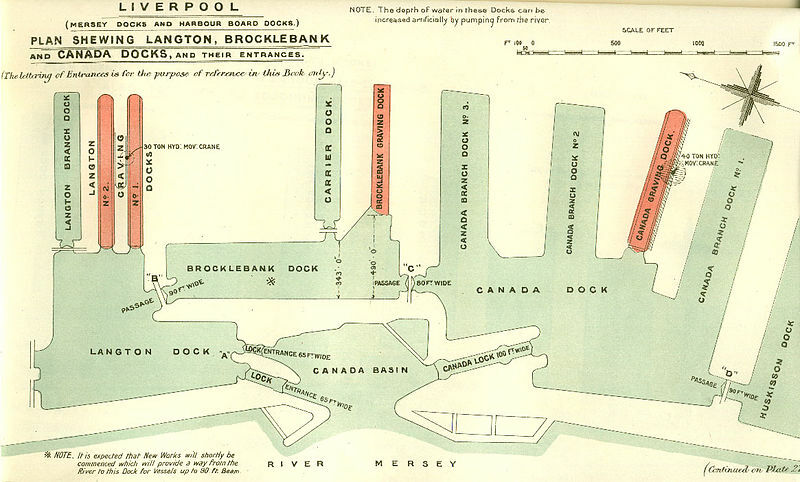 Other branch docks have been filled in, in the north end with a sewage processing plant being built at Sandon Dock. 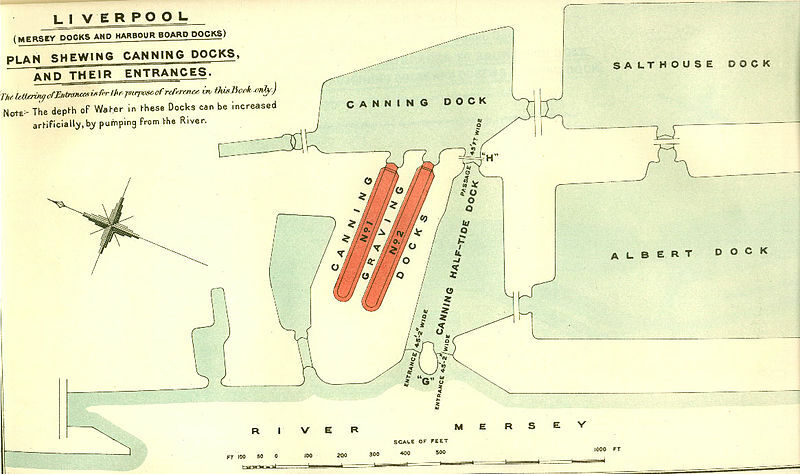 Both White Star Line and Cunard Line were based at the port. It was also the home port of many great ships, including RMS Baltic and the ill starred Tayleur, MV Derbyshire, HMHS Britannic, and the RMS Lusitania. The largest dock on the dock network, Seaforth Dock, was opened in 1972 dealing with grain and containers, accommodating the largest containers ships of the time. The dock is still growing and developing. There are new container services, animal feed stores and warehouses. 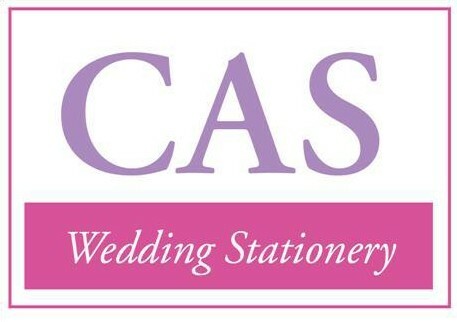 It is also part of the Atlantic Gateway initiative. 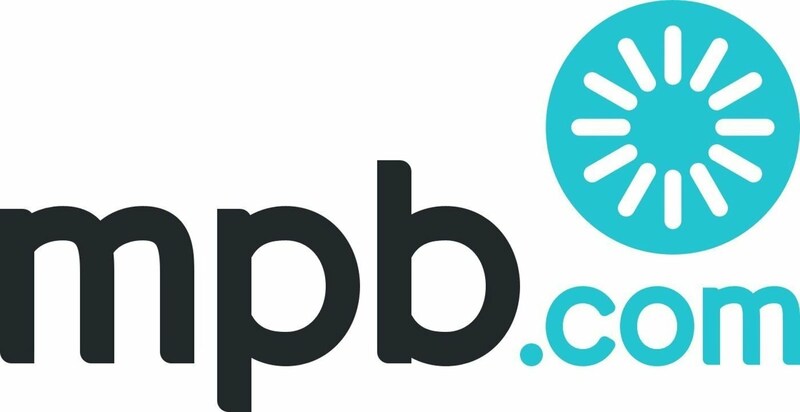 This aims to improve communications, business and quality of life for residents and businesses in the north of Liverpool. From 29th May 2012, Liverpool has been home to a brand new cruise terminal. Up until then, cruise ships were only able to make fleeting visits to the city, but the new terminal has enabled them to stop off over longer periods of time, with cruises starting and finishing in Liverpool. 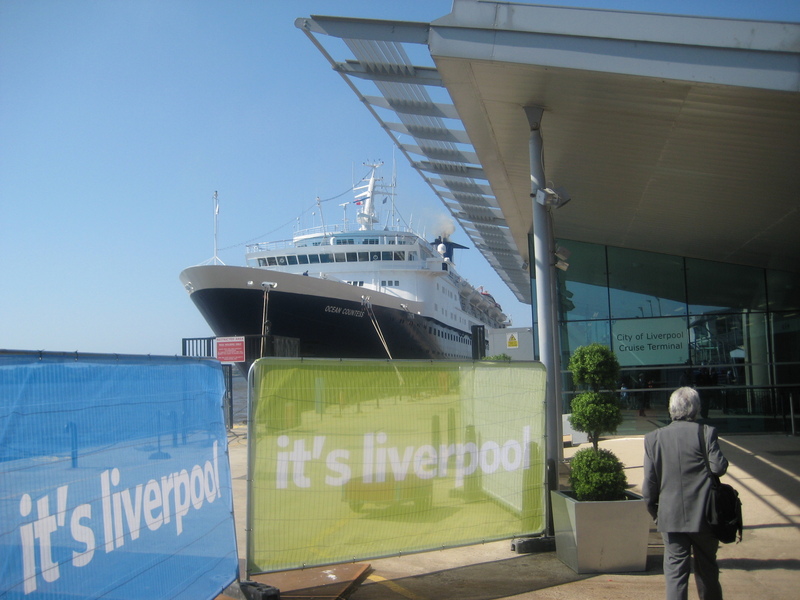 The Liverpool Cruise Terminal is set for its busiest year to date as it prepares to welcome 54 cruise ships in 2015, bringing with them more than 80,000 international visitors to the city. 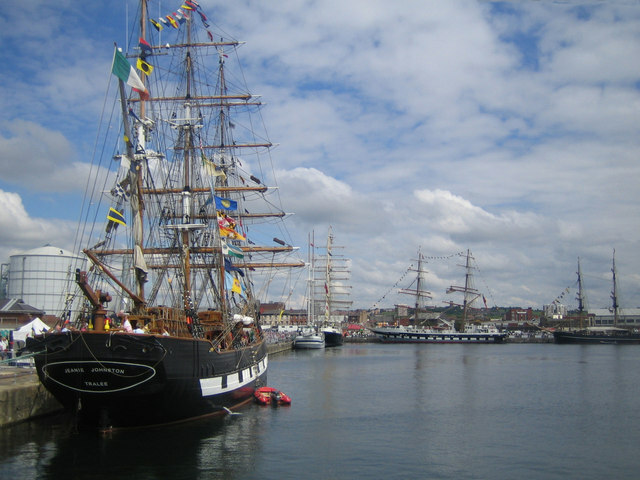 Many of the new vessels and cruise lines will be making their inaugural calls along the Mersey to the historic port. The highlight of the season will be two events to celebrate Cunard Cruise Line’s 175th anniversary. The first, on May 25, will see the Cunard fleet arrive on the Mersey, creating an unprecedented Three Queens spectacle in Liverpool that will make maritime history. For the second, on July 4, July, the Cunard flagship Queen Mary 2 will return to Liverpool to celebrate Britannia’s transatlantic departure exactly 175 years earlier. There will be a series of events across the city celebrating the glamour and excitement of cruise travel and how an industry that was born in Liverpool changed the world culturally.